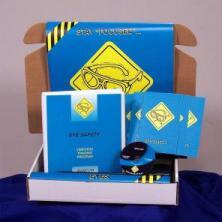 MARCOM's "Eye Safety" Safety Meeting Kit™ shows how many eye problems are caused by not paying attention to the work employees are doing, or by not wearing the appropriate protective equipment. It reminds employees that eye injuries can easily happen to them and shows them how to prevent these injuries. Most employees take "healthy eyes" for granted. But our eyes are really very fragile, and statistics show that eye injuries occur frequently in the workplace. Materials in the kit include a video program, five motivational posters, and 30 employee booklets. The posters in the kit emphasize the importance of using proper protective eye wear. The videotape and employee booklets include information on physiology of the eye and how it functions, common eye injuries and how they are caused, short and long-term effects of eye injuries, eye care and safety practices, selecting and using appropriate personal protective equipment, and more. The video program in the kit comes with a comprehensive leader's guide, reproducible scheduling & attendance form, employee quiz, training certificate and training log.